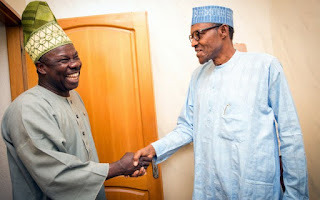 Governor Ibikunle Amosun has described President Buhari as a patient man who has reformed himself in line with democratic ethos. Mr. Buhari ruled Nigeria between late 1983 and August 1985 as a military head of state following a coup d’etat. Amongst the major concerns his critics raised when he was campaigning to rule Nigeria again as a democratic leader was his respect for democratic institutions. Mr. Amosun featured alongside Vice President Yemi Osinbajo and Babatunde Fashola in a documentary series that is set to hit the airwaves beginning tonight. Excerpts of the documentary, which the State House billed as an attempt to make Nigerians see the ‘human side’ of Mr. Buhari, were made available to PREMIUM TIMES Sunday morning. Presidential spokesperson Femi Adesina said the documentary titled: ‘The Human Side of President Buhari’ would depict the septuagenarian in a way never before. “It is made up of interviews from close aides of the President and some others who have worked closely with him, carefully put together to show a side of the President that many would love to see,” Mr. Adesina explained. .
“He gives you things to do, and leaves you strictly to do those things. No interference at all, once he has confidence in you….And he cracks those jokes, and manages to still keep a straight face,” Mr. Osinbajo said in his description of the president. “He gave me some priority projects: Mokwa/Jebba road, Lagos/Ibadan Expressway, and Second Niger Bridge…He never appends his signature to anything, unless you’ve explained, and he understands it.” Mr. Fashola, Minister of Power, Works and Housing, said. The 55-minute documentary is scheduled to air on NTA tonight from 8:00 p.m. Channels Television would broadcast it on Monday, December 25, 2017 (Christmas Day) between 8-9:00 p.m.